Unique color. Great base and TTT. Cowboy Catchit Chex son. 3% Tari. The perfect cow in my opinion. 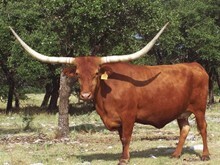 Horn, size, temperament, production. Was fortunate to own her for 5 years. Wiregrass Laura is a producer! 12.5% Phenomenon. Sold to Deer Creek Longhorns at 2016 Legacy Sale. Have 5 daughters and using 2 sons. 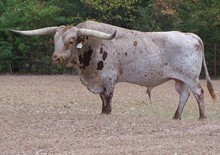 A Wiregrass Laura daughter. Laura hit with WS Jamakizm and Top Caliber. 12.5% Phenomenon. Was fortunate to own her for several years. Sold to Richard and Jeanie Filip at Hudson Valentine Sale in Bowling Green. Elegance, grace, beauty and serious horn. 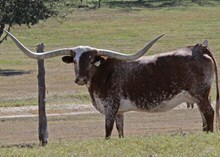 As regal and pretty as a longhorn cow can get. One of Top Caliber's best daughters. Love her horn set. I own a full sister that doesn't look much like her but is incredibly productive. It helped me understand the power of sibling genetics. His lack of color scared me initially but after seeing his progeny he seems to throw a lot of color???? Interesting pedigree with Top Caliber, HCR, BL Night Chex and a double hit of JR Grand Slam on bottom. HR Slam's Rose as the Anchor cow is a plus. 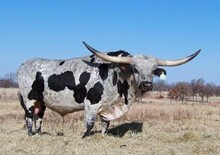 One of the first 80" bulls (Temptations the Ace) for a sire over super productive Field of Pearls. 12.5% Phenomenon. Strong on both sides of the line......paternal and maternal. WS Jamakizm over HCR's most productive line, Hunts Jupiter. Super docile, beautiful color, great horns. Will be another 90" TTT WS Jamakizm female. Owned her for several years. Sold to the Craft's at Hudson Valentine Stockyard Sale. Still have two daughters of hers and one son in the herd. Tempter and Field of Pearls over Texana Van Horne, Starlight and linebred Emperor offspring Delta Van Horne make for a powerful mix. Fell in love with her horn set. Was a late bloomer and added a lot! of TTT late in her career. Watson breeding top and bottom. Will always be my favorite bull. Greatly influenced my herd forever. Has come into his own. 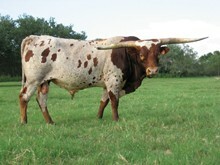 A producer of great bulls and the leader in 90" TTT females. Linebred Zhivago. Super producer. Great example of better horn production in her offspring, mostly bulls, than her own TTT and TH. Produced numerous over 80" sons. Line bred Classic. 12.5% Phenomenon. Producer. 90" beauty. Old school genetics. 6% Phenomenon, 3% Tari. The best daughter of Awesome Viagra. 25% Phenomenon. 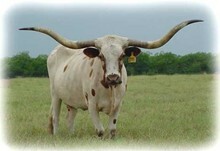 Great size, color and Total Horn. Lucky to have a daughter of hers. Also used a son of hers, BR Tempting Fate. She has Bail Jumper 3 times on bottom side. The combo of Phenomenon and Starlight show up in some of the best pedigrees in the business. Timeless. Both sides of the pedigree have power. Linebred Classic on top which kept her small in size but also what makes her potent as a breeder. Maternal side is the best in the business. 6% Phenomenon. Flat horn set. The first cow over 90" TTT. Was way ahead of her time. One of several females that have a Farlap Chex daughter for a dam. There is power there. Linebred Classic over Working Woman. 12.5% Phenomenon. The sire of Poco Lady and not given enough credit for that. 50% Phenomenon. Has several excellent progeny. The only place I know where you can still access Tari Graves at 50%. Worked well with HCR genetics. One of the trio of full blood brothers. Tuff, Up and Cowboy Catchit. 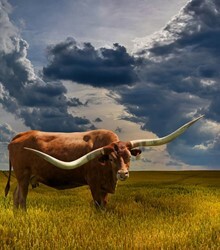 Of the three I like the female horn sets that Cowboy Catchit Chex is putting out there. Not much to show for himself in progeny but has the perfect stamping of 25% Phenomenon and 25% Tari Graves. I believe he could still be used successfully today. Linebred Bevo over heavy Butler influence. Seems to really explode in 2-3 generations. See BL Rio Catchit, Awesome Nova, BL Sage Hen, all the Mazue's, Painted Safari BL, Indian Safari BL, to name a few....plenty more. Powerful. An up and comer. Has the genetic power of Fifty Fifty and the additional TTT that Vanilla Milkshake can bring but yet in a black and white wrapper. Poco Lady, Working Woman, Ringa Dinger....stacked female pedigree. 9% Phenomenon. This is a wonderful blend of the best of the best Loomis dam side genetics. Poco Lady, Lady Monika and Night Safari. And in a Black and white wrapper, with a laid down horn set. Will be using him in the future. Shadow over VJ Tommie. Like O+ blood, a universal donor. Mixes with everything and adds lots of color. The queen of twist. I think she got it from Doherty 698. Linebred Cowcatcher. I am just starting to understand the power of Phenomenon in a pedigree. He is listed in 13 of the 55 current 90" TTT cows. That is more than a coincidence. Some of the best have 12.5-25%. The beginning of the most consistent maternal line genetics. 25% Phenomenon is not a coincidence either. 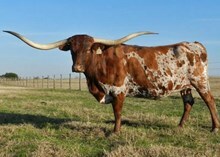 One of the absolute best longhorn cows ever. Beauty personified. She has the color that everyone loves. great horn set and another incredible daughter of WS Jamakizm. The combo of Cowboy Tuff over a Drag Iron daughter out of Field of Pearls pulls a lot of things together for me genetically. A more colorful full brother to Awesome Viagra. One of a handful of homozygous black and white bulls. To my knowledge he has the most TTT of any of the others. If anyone wanted to incorporate black into their herd this would be a good place to start. I think of Tabasco as nitroglycerin of genetics. Linebred Bevo 3 times in the form of Monarch and Classic. A true Butler genetic punch. 80" of TTT greatness and born in 1992. Way ahead of her time and has contributed so much to the progress we see today in 90" plus horns. I like what I am seeing from him. He is on my watch list. Starlight over linebred Emperor. Produces way above himself. He use to graze near my children's grade school and I would drive by thinking who is that????? Finally learned who it was and met his owner, Roger Hutton. Roger was a great mentor to me and this is one of the ways I started in longhorns. Roger also owned Winchester. My first exposure to conformation and horn on the same animal. Produced both Show winners and 90" TTT. Super productive cross with WS Jamakizm. Who knew???? Super productive cow. Crossed with many different bloodlines. Has at least two 90" TTT daughters in Helm Laura's Light Mocha and Helm TC Laura's Mercy. Linebred Classic over Working Woman. 12.5% Phenomenon. Full brother to BL Rodeo Chex. Another female ahead of her time. Super productive. 25% Phenomenon. Really cool looking to me. On my watch list. 6% Phenomenon and 6% Tari. Very strong dam side with WS Sun Star at 90" and grand dam WS Sun Rise at 88". Mix of 25% WS Jamakizm, 9% Phenomenon, 9% Tari and 6% Starlight. And let's not forget ECR Eternal Tari at 25%. Loaded.